Average Wind and Sea Conditions: About 15 knots, from the north, then the south! Note that you can also read the newsletters we emailed while we were on this passage. They reflect our at-the-moment thoughts and feelings while we were out there. 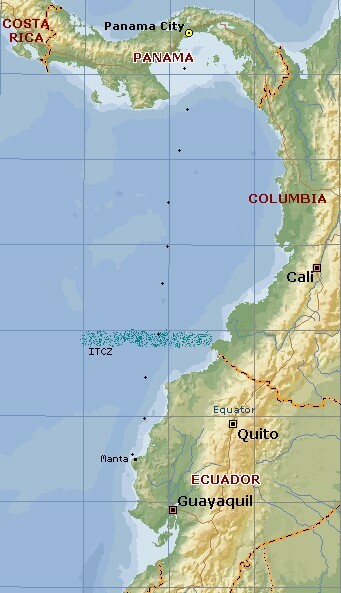 (Sue) It was exciting to finally be pushing off from Panama. By sailing south along the Colombian coast, we're lengthening our stay in Latin America, which I love. I remember from 1988, when we were cruising in Oriental Lady, being quite concerned about the big tidal change on the Pacific Side of Panama, but given that we spent most of our time on a mooring (thereby insuring there was ample water under us), the tide was less of an issue this time. Once we were sailing, it became irrelevant. Unfortunately, our departure coincided with the dark of the moon, once again, so we had black, black nights (though the stars were bright). Leaving the shipping lanes of Panama behind was a relief as it is quite nerve-wracking to have 4 or 5 ships on the horizon at one time, all criss-crossing paths. It seems that the Pacific side of Panama is one of the few areas of no magnetic variation. That is, Magnetic north is the same as True north. Therefore, ships like to turn slow circles our here, calibrating their compasses. This can be quite disconcerting to a small sailboat. 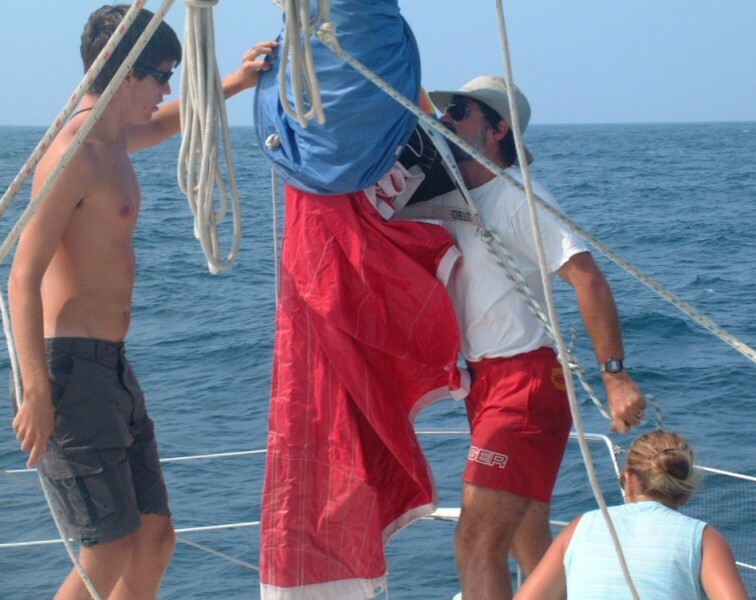 (Amanda age 13) I sort of started this sail off dreading what could happen, but after a bit of the calm seas and nice wind, I shook that feeling off. Curacao to San Blas was the nastiest bit of water in the Caribbean, and the South Pacific isn't usually like that. We also got to sleep a lot more, as we were only really "on" watch an hour and a half. I also took out our LED headlamp and read for most of the hour and a half, with a timer for every ten minutes. 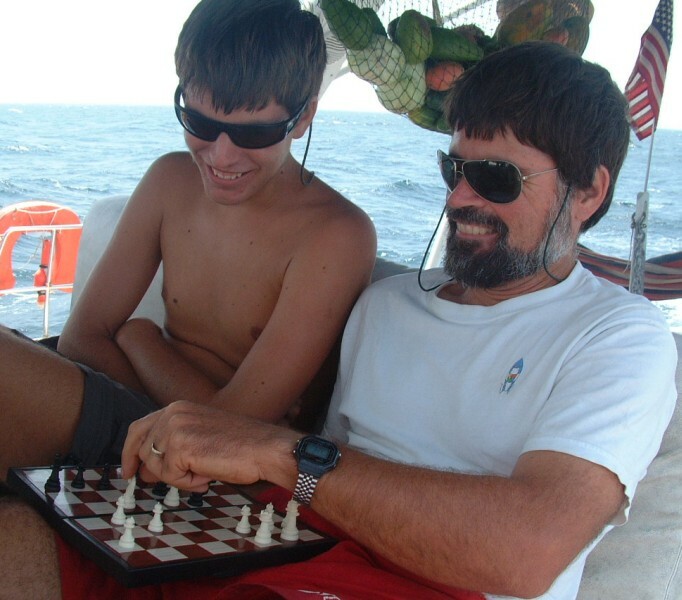 I kept my eyes on ships around us - there were a lot heading from South America to Panama - and called Dad (who was my secondary while I was on) only if it appeared to be getting closer faster than it got out of the way. And since we had the autopilot, we didn't have to stress about hand steering at all, except for morning and evening scheds on the SSB, when the motor affects the radio. And, lucky me, who do you think was always on watch during those times? ME! It wasn't that bad, though. Seas weren't high at all, and I had my CD player to keep me company. Another thing, I reeled in my first fish on this passage. We weren't all that far out, we could still see land, but I was sitting my watch in the morning and suddenly my mom comes out of the cabin and yells, "Fish on!" I hopped off the helm seat and got to pull it in. It looked really big at first, with the wake it was putting up, but I pulled it out and it was only about a foot or so. I looked it up on our fish ID program, and I think I got a match, but the program only has scientific names. Still, we got fish for dinner! (Chris age 16) Well, our second passage was almost nothing like our first. It took about the same amount of time, but almost everything else was better. First off, the seas and wind were much more comfortable. Second, we had the new autopilot, so we revised our watch schedule so each person was only on watch for 90 minutes at a time, then acted as backup for another 90 minutes. Lots more sleep! Third, after our first multi-day passage, the second one just wasn't as 'new' or 'worrisome.' It still wasn't my favorite way to spend five days, but it sure beat the first passage. I also discovered the way to handle night watches: a portable CD player with headphones and anti-skip. During the day I tried to thump Dad at chess. (Jon) We actually had a delightful sail for the first few days. We left Panama with a brisk 20 knots behind us - a bit much for the spinnaker but good for making time. We even had a bit of current assisting us. Having caught very few fish in the Caribbean, we caught a nice tuna early on, which we thought was an auspicious welcome to the Pacific. The third day we actually did get the spinnaker up and had a glorious sail with it for several hours. Then we saw what appeared to be a standard squall-line cloud in front of us, so we doused the chute and proceeded under all plain sail. The breeze continued to die as we approached and by the time we actually reached the cloud we had to motor. Imagine our surprise when, an hour later, we get to the other side of the cloud only to find wind, swell, and current all against us! Not fair! Apparently, this was the Inter Tropical Convergence Zone (ITCZ), where the the SE trades of the South Pacific meet the NE trades of the North Pacific. All distances are in Nautical miles and speeds in Knots (nautical miles/hour). Nautical miles are about 6,000 ft, or about 15% longer than statute miles. To get True wind speed, add Boat speed to Apparent wind speed (this only works when you're going down wind). Wind Speed and Wind Direction are both Apparent (What the instruments perceive it to be, and the way our sails and we feel it).